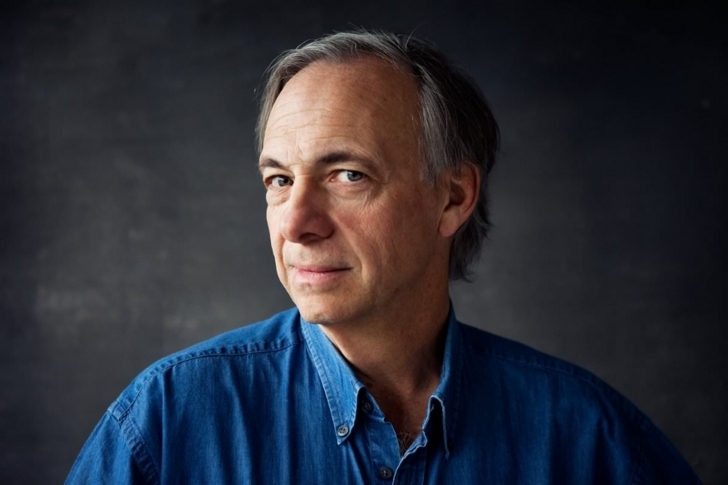 Ray Dalio (born August 8, 1949) is an American businessman and founder of the investment firm Bridgewater Associates. In 2012, Dalio appeared on the annual Time 100 list of the 100 most influential people in the world. In 2011 and 2012 he was listed by Bloomberg Markets as one of the 50 Most Influential people. Institutional Investor’s Alpha ranked him No. 2 on their 2012 Rich List. According to Forbes, he was the 30th richest person in America and the 69th richest person in the world with a net worth of $15.2 billion as of October 2014. But many people don't understand it or they don't agree on how it works and this has led to a lot of needless economic suffering. I feel a deep sense of responsibility to share my simple but practical economic template. Though it's unconventional, it has helped me to anticipate and sidestep the global financial crisis, and has worked well for me for over 30 years. 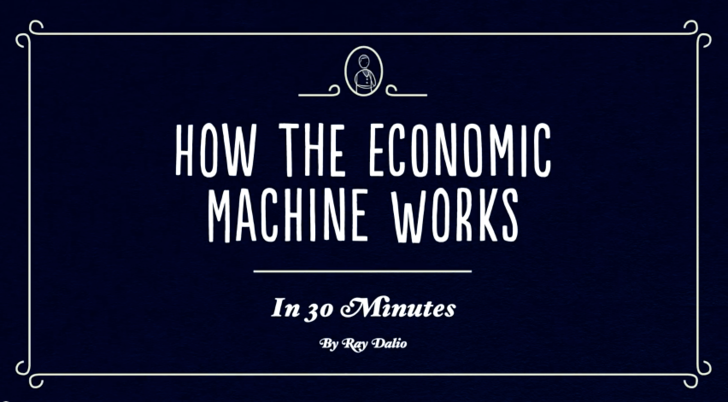 Though the economy might seem complex, it works in a simple, mechanical way. It's made up of a few simple parts and a lot of simple transactions that are repeated over and over again a zillion times. These transactions are above all else driven by human nature, and they create 3 main forces that drive the economy. 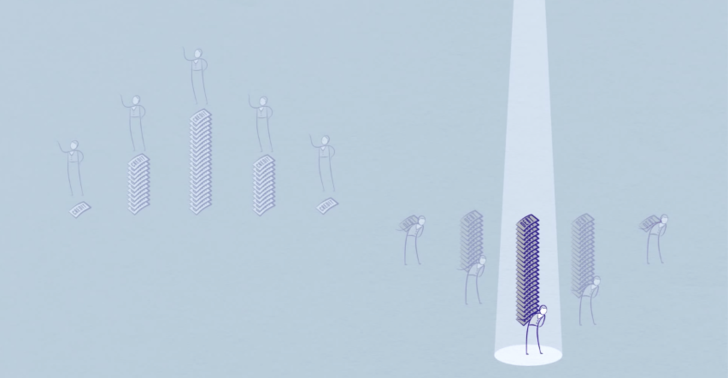 We'll look at these three forces and how laying them on top of each other creates a good template for tracking economic movements and figuring out what's happening now. 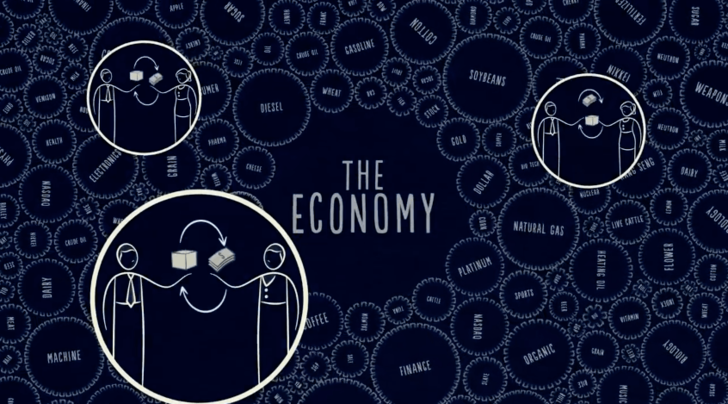 Let's start with the simplest part of the economy: Transactions. An economy is simply the sum of the transactions that make it up and a transaction is a very simple thing. Every time you buy something you create a transaction. Each transaction consists of a buyer exchanging money or credit with a seller for goods, services or financial assets. Credit spends just like money, so adding together the money spent and the amount of credit spent, you can know the total spending. The total amount of spending drives the economy. If you divide the amount spent by the quantity sold, you get the price. And that's it. That's a transaction. It is the building block of the economic machine. 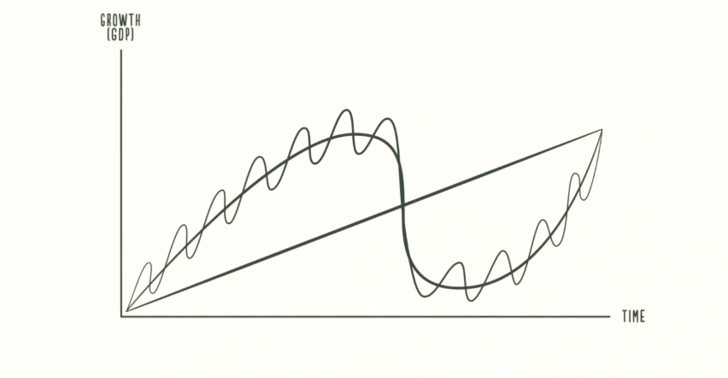 All cycles and all forces in an economy are driven by transactions. So, if we can understand transactions, we can understand the whole economy. A market consists of all the buyers and all the sellers making transactions for the same thing. For example, there is a wheat market, a car market, a stock market and markets for millions of things. An economy consists of all of the transactions in all of its markets. If you add up the total spending and the total quantity sold in all of the markets, you have everything you need to know to understand the economy. People, businesses, banks and governments all engage in transactions the way I just described: exchanging money and credit for goods, services and financial assets. ...and a Central Bank, which is different from other buyers and sellers because it controls the amount of money and credit in the economy. It does this by influencing interest rates and printing new money. For these reasons, as we'll see, the Central Bank is an important player in the flow of Credit. I want you to pay attention to credit. Credit is the most important part of the economy, and probably the least understood. It is the most important part because it is the biggest and most volatile part. 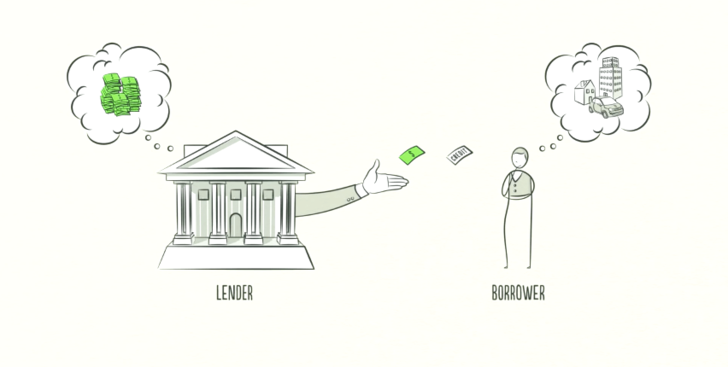 Just like buyers and sellers go to the market to make transactions, so do lenders and borrowers. Lenders usually want to make their money into more money and borrowers usually want to buy something they can't afford, like a house or car or they want to invest in something like starting a business. 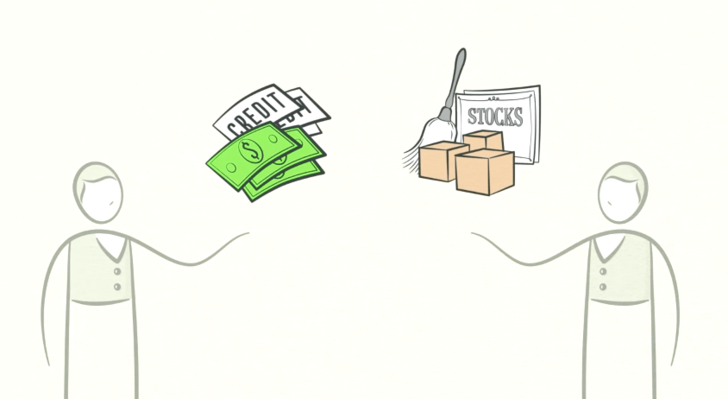 Credit can help both lenders and borrowers get what they want. Borrowers promise to repay the amount they borrow, called the principal, plus an additional amount, called interest. When interest rates are high, there is less borrowing because it's expensive. When interest rates are low, borrowing increases because it's cheaper. 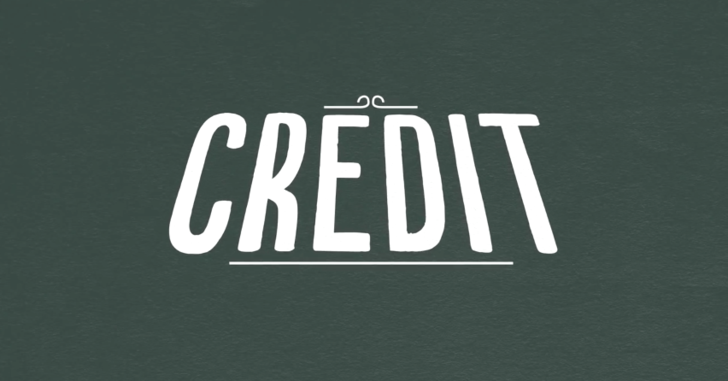 When borrowers promise to repay and lenders believe them, credit is created. Any two people can agree to create credit out of thin air! That seems simple enough but credit is tricky because it has different names. 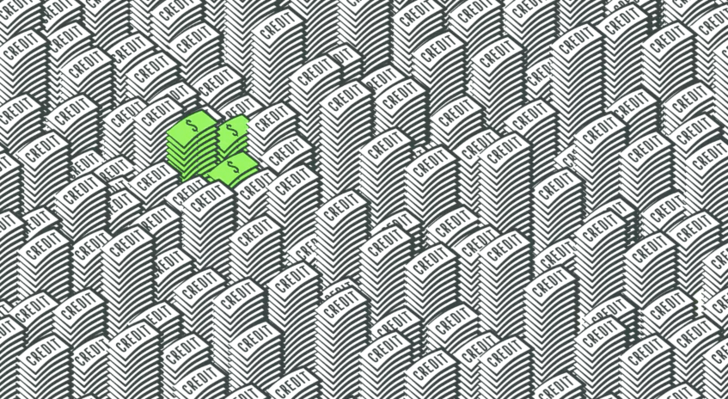 As soon as credit is created, it immediately turns into debt. Debt is both an asset to the lender, and a liability to the borrower. In the future, when the borrower repays the loan, plus interest, the asset and liability disappear and the transaction is settled. Because when a borrower receives credit, he is able to increase his spending. And remember, spending drives the economy. This is because one person's spending is another person's income. Think about it, every dollar you spend, someone else earns. and every dollar you earn, someone else has spent. So when you spend more, someone else earns more. When someone's income rises it makes lenders more willing to lend him money because now he's more worthy of credit. A creditworthy borrower has two things: the ability to repay and collateral. In the event that he can't repay, he has valuable assets to use as collateral that can be sold. So increased income allows increased borrowing which allows increased spending. And since one person's spending is another person's income, this leads to more increased borrowing and so on. This self-reinforcing pattern leads to economic growth and is why we have Cycles. In a transaction, you have to give something in order to get something and how much you get depends on how much you produce over time we learned and that accumulated knowledge raises are living standards we call this productivity growth those who were invented and hard-working raise their productivity and their living standards faster than those who are complacent and lazy, but that isn't necessarily true over the short run. This is because productivity growth doesn't fluctuate much, so it's not a big driver of economic swings. Debt is — because it allows us to consume more than we produce when we acquire it and it forces us to consume less than we produce when we pay it back. While most people feel the swings, they typically don't see them as cycles because they see them too up close -- day by day, week by week. 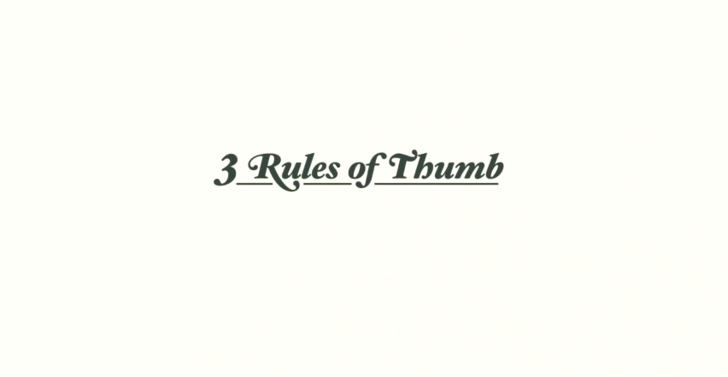 In this chapter we are going to step back and look at these three big forces and how they interact to make up our experiences. 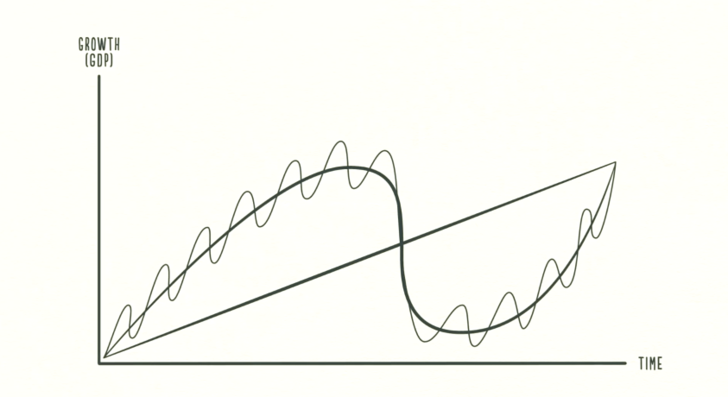 How the credit causes a "wave " and " cycle"
As mentioned, swings around the line are not due to how much innovation or hard work there is, they're primarily due to how much credit there is. Let's for a second imagine an economy without credit. In this economy, the only way I can increase my spending is to increase my income, which requires me to be more productive and do more work. 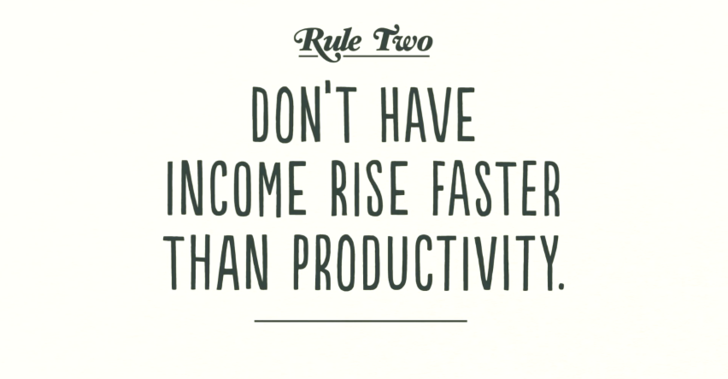 Since my spending is another person's income, the economy grows every time I or anyone else is more productive. If we follow the transactions and play this out, we see a progression like the productivity growth line. This isn't due to any laws or regulation, it's due to human nature and the way that credit works. In order to buy something you can't afford, you need to spend more than you make. In doing so you create a time in the future that you need to spend less than you make in order to pay it back. This is why understanding credit is so important because it sets into motion a mechanical, predictable series of events that will happen in the future. The difference between "credit ", " money "
When you buy a beer from a bartender with cash, the transaction is settled immediately. But when you buy a beer with credit, it's like starting a bar tab. You're saying you promise to pay in the future. 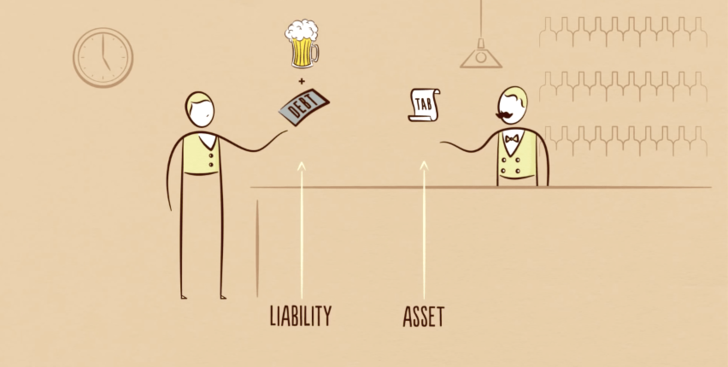 It's not until you pay the bar tab later that the asset and liability disappear, the debt goes away and the transaction is settled. The total amount of credit in the United States is about $50 trillion and the total amount of money is only about $3 trillion. Remember, in an economy without credit: the only way to increase your spending is to produce more. But in an economy with credit, you can also increase your spending by borrowing. As a result, an economy with credit has more spending and allows incomes to rise faster than productivity over the short run, but not over the long run. Now, don't get me wrong, credit isn't necessarily something bad that just causes cycles. It's bad when it finances over-consumption that can't be paid back. However, it's good when it efficiently allocates resources and produces income so you can pay back the debt. 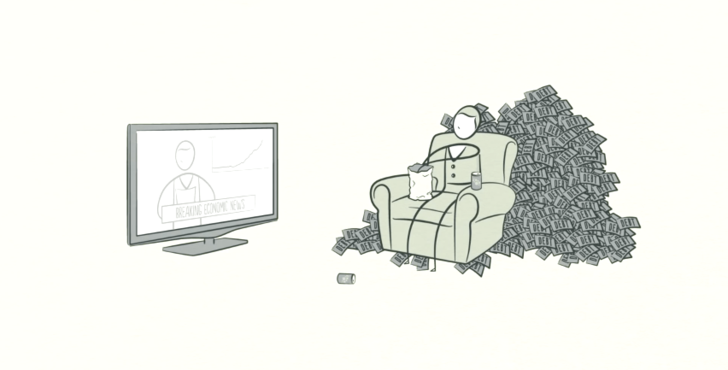 For example, if you borrow money to buy a big TV, it doesn't generate income for you to pay back the debt. 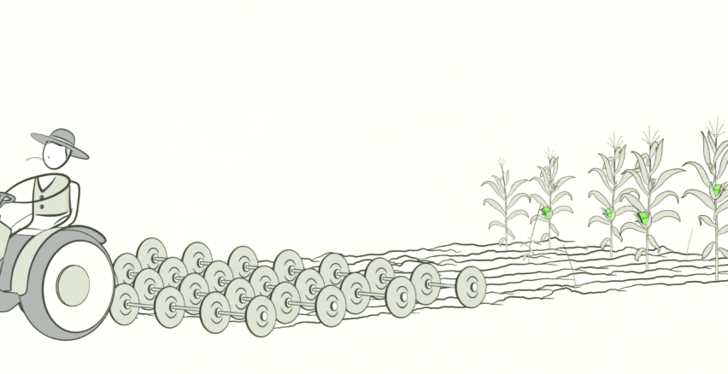 But, if you borrow money to buy a tractor — and that tractor let's you harvest more crops and earn more money — then, you can pay back your debt and improve your living standards. 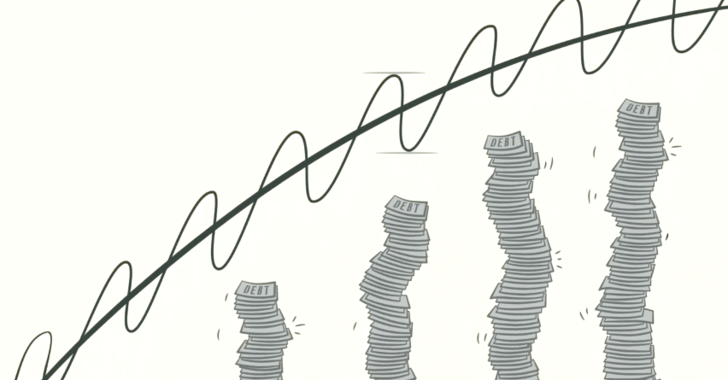 In an economy with credit, we can follow the transactions and see how credit creates growth. Let me give you an example: Suppose you earn $100,000 a year and have no debt. You are creditworthy enough to borrow $10,000 dollars - say on a credit card - so you can spend $110,000 dollars even though you only earn $100,000 dollars. Since your spending is another person's income, someone is earning $110,000 dollars. The person earning $110,000 dollars with no debt can borrow $11,000 dollars, so he can spend $121,000 dollars even though he has only earned $110,000 dollars. His spending is another person's income and by following the transactions we can begin to see how this process works in a self-reinforcing pattern. 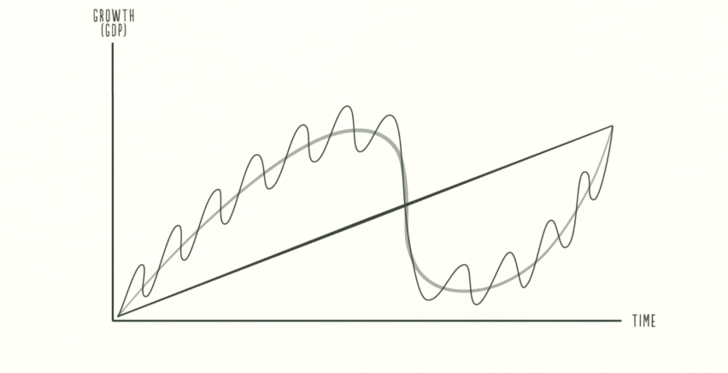 But remember, borrowing creates cycles and if the cycle goes up, it eventually needs to come down. As economic activity increases, we see an expansion - the first phase of the short term debt cycle. This happens because the increase in spending is fueled by credit - which can be created instantly out of thin air. When the amount of spending and incomes grow faster than the production of goods: prices rise. 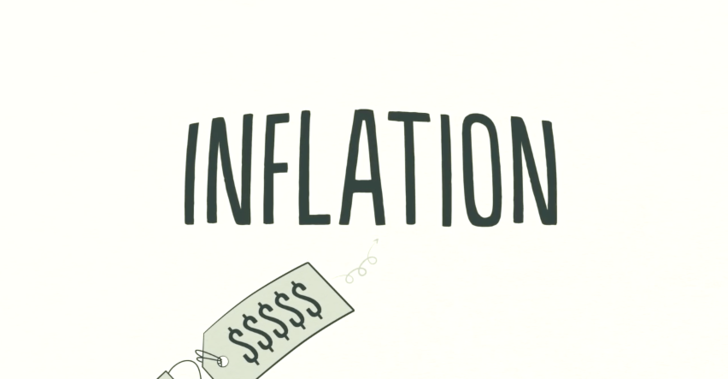 The Central Bank doesn't want too much inflation because it causes problems. Think about this as the monthly payments on your credit card going up. 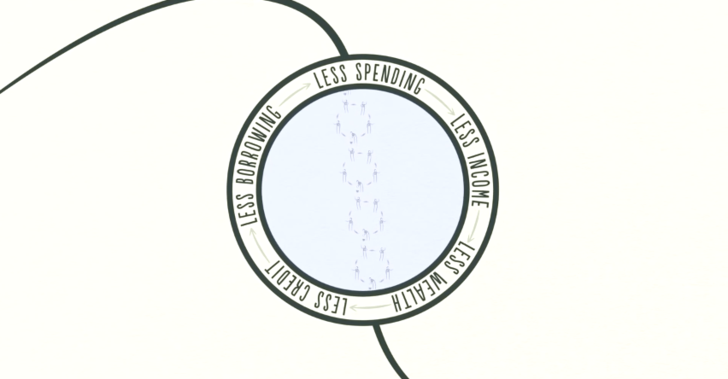 Because people borrow less and have higher debt repayments, they have less money leftover to spend, so spending slows ...and since one person's spending is another person's income, incomes drop...and so on and so forth. If the recession becomes too severe and inflation is no longer a problem, the central bank will lower interest rates to cause everything to pick up again. With low interest rates, debt repayments are reduced and borrowing and spending pick up and we see another expansion. In the short term debt cycle, spending is constrained only by the willingness of lenders and borrowers to provide and receive credit. 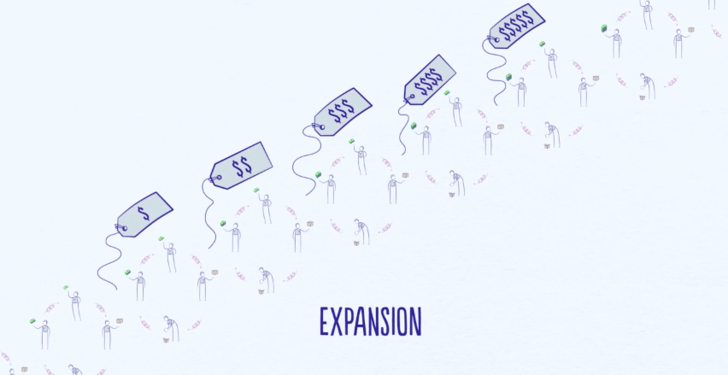 When credit is easily available, there's an economic expansion. When credit isn't easily available, there's a recession. The short term debt cycle typically lasts 5 - 8 years and happens over and over again for decades. But notice that the bottom and top of each cycle finish with more growth than the previous cycle and with more debt. Because people push it — they have an inclination to borrow and spend more instead of paying back debt. 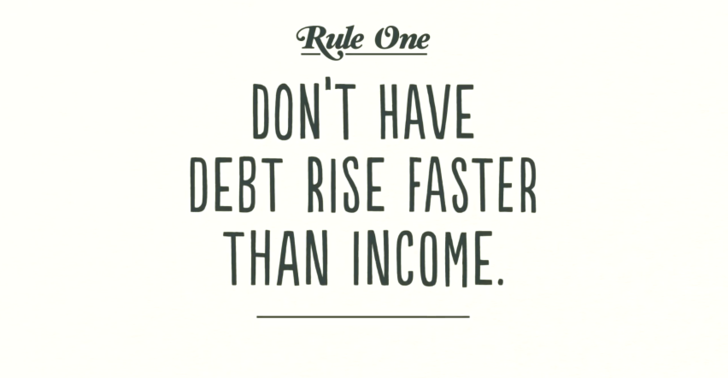 Because of this, over long periods of time, debts rise faster than incomes creating the Long Term Debt Cycle. Despite people becoming more indebted, lenders even more freely extend credit. People are just focusing on what's been happening lately. 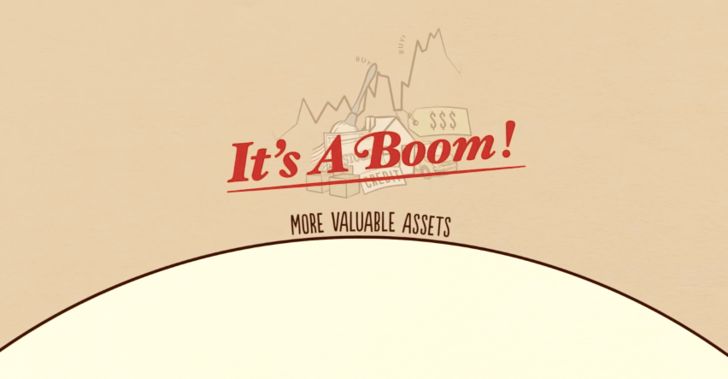 It pays to buy goods, services, and financial assets with borrowed money! So even though debts have been growing, incomes have been growing nearly as fast to offset them. Let's call the ratio of debt-to-income the debt burden. So long as incomes continue to rise, the debt burden stays manageable. 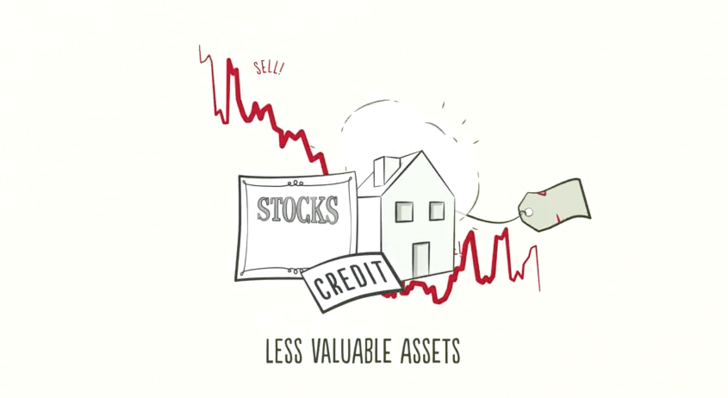 People borrow huge amounts of money to buy assets as investments causing their prices to rise even higher. So even with the accumulation of lots of debt, rising incomes and asset values help borrowers remain creditworthy for a long time. 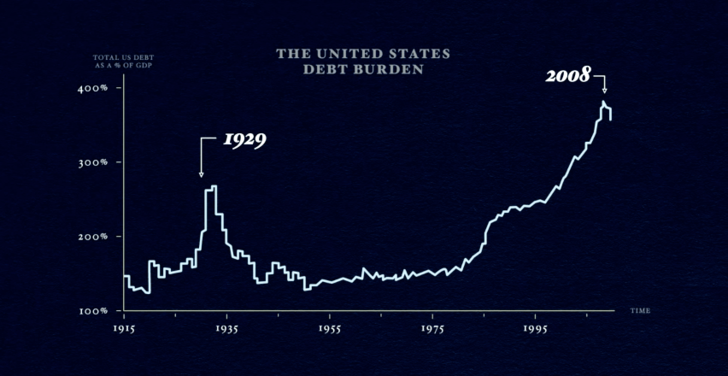 Over decades, debt burdens slowly increase creating larger and larger debt repayments. At some point, debt repayments start growing faster than incomes forcing people to cut back on their spending. And since one person's spending is another person's income, incomes begin to go down......which makes people less creditworthy causing borrowing to go down. Debt repayments continue to rise which makes spending drop even further......and the cycle reverses itself. For the United States, Europe and much of the rest of the world this happened in 2008. It happened for the same reason it happened in Japan in 1989 and in the United States back in 1929. In a deleveraging; people cut spending, incomes fall, credit disappears, assets prices drop, banks get squeezed, the stock market crashes, social tensions rise and the whole thing starts to feed on itself the other way. As incomes fall and debt repayments rise, borrowers get squeezed. No longer creditworthy, credit dries up and borrowers can no longer borrow enough money to make their debt repayments. The rush to sell assets floods the market This is when the stock market collapses, the real estate market tanks and banks get into trouble. This appears similar to a recession but the difference here is that interest rates can't be lowered to save the day. However, in a deleveraging, lowering interest rates doesn't work because interest rates are already low and soon hit 0% - so the stimulation ends. 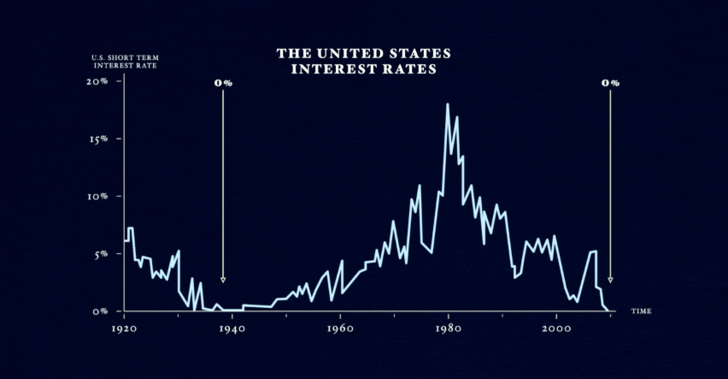 Interest rates in the United States hit 0% during the deleveraging of the 1930s and again in 2008. The difference between a recession and a deleveraging is that in a deleveraging borrowers' debt burdens have simply gotten too big and can't be relieved by lowering interest rates. They feel crippled by the debt - they don't even want more! Lenders stop lending. Borrowers stop borrowing. 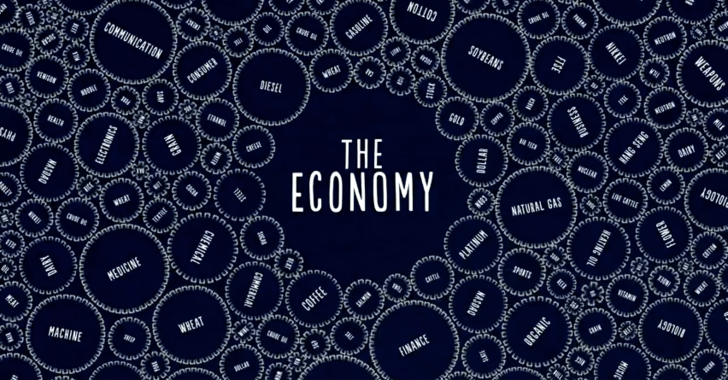 Think of the economy as being not-creditworthy, just like an individual. people, businesses, and governments cut their spending. debts are reduced through defaults and restructurings. 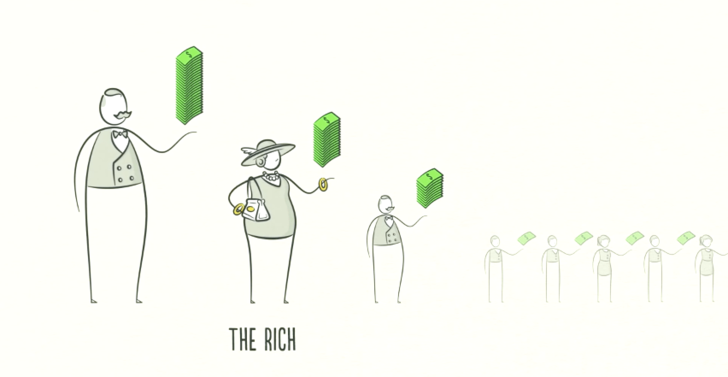 wealth is redistributed from the 'haves' to the 'have nots'. the central bank prints new money. As we just saw, people, businesses, banks and even governments tighten their belts and cut their spending so that they can pay down their debt. When borrowers stop taking on new debts, and start paying down old debts, you might expect the debt burden to decrease. But the opposite happens! Because spending is cut - and one man's spending is another man's income - it causes incomes to fall. They fall faster than debts are repaid and the debt burden actually gets worse. As we've seen, this cut in spending is deflationary and painful. Businesses are forced to cut costs...which means less jobs and higher unemployment. Many borrowers find themselves unable to repay their loans — and a borrower's debts are a lender's assets. When borrowers don't repay the bank, people get nervous that the bank won't be able to repay them so they rush to withdraw their money from the bank. 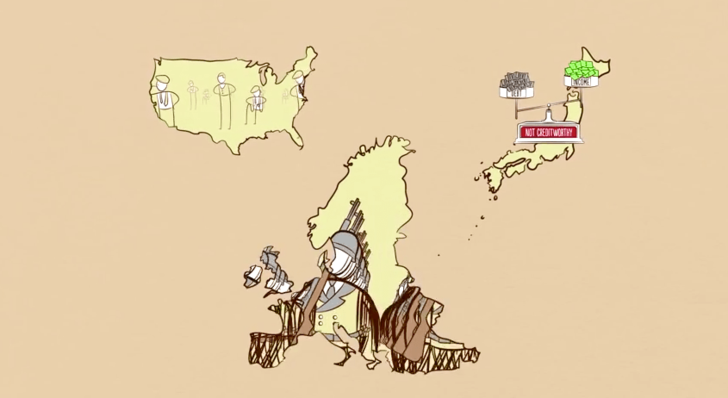 Banks get squeezed and people, businesses and banks default on their debts. This severe economic contraction is a depression. A big part of a depression is people discovering much of what they thought was their wealth isn't really there. Let's go back to the bar. When you bought a beer and put it on a bar tab, you promised to repay the bartender. Your promise became an asset of the bartender. But if you break your promise - if you don't pay him back and essentially default on your bar tab - then the 'asset' he has isn't really worth anything. Many lenders don't want their assets to disappear and agree to debt restructuring. Debt restructuring means lenders get paid backless or get paid back over a longer time frame or at a lower interest rate that was first agreed. Somehow a contract is broken in a way that reduces debt. Lenders would rather have a little of something than all of nothing. Even though debt disappears, debt restructuring causes income and asset values to disappear faster, so the debt burden continues to gets worse. 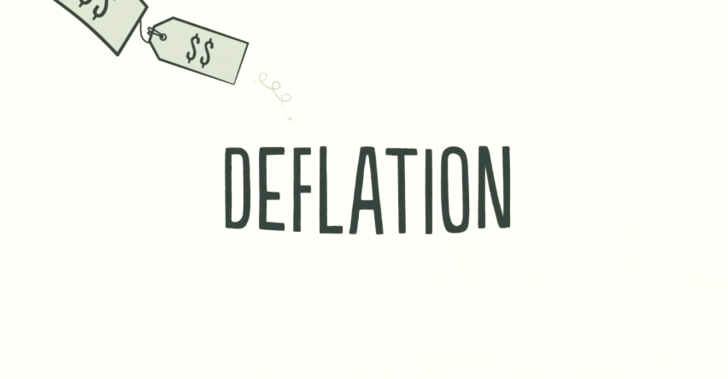 Like cutting spending, debt reduction is also painful and deflationary. All of this impacts the central government because lower incomes and less employment means the government collects fewer taxes. Many of the unemployed have inadequate saving and need financial support from the government. Additionally, governments create stimulus plans and increase their spending to make up for the decrease in the economy. Governments' budget deficits explode in a deleveraging because they spend more than they earn in taxes. To fund their deficits, governments need to either raise taxes or borrow money. But with incomes falling and so many unemployed, who is the money going to come from? Not only do tensions rise within countries, they can rise between countries - especially debtor and creditor countries. 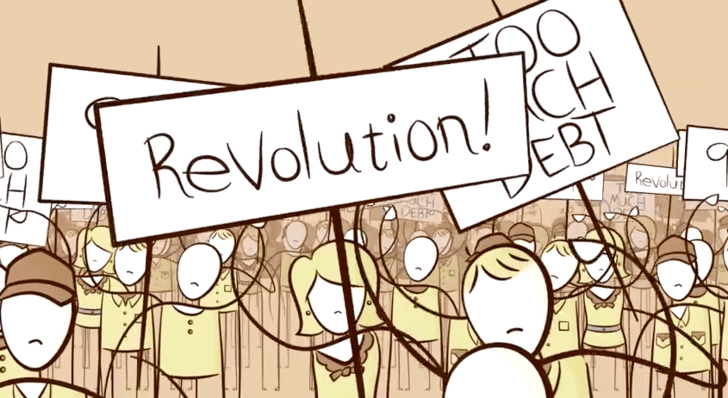 This situation can lead to political change that can sometimes be extreme. In the 1930s, this led to Hitler coming to power, war in Europe, and depression in the United States. Pressure to do something to end the depression increases. So, when credit disappears, people don't have enough money. The role of central bankPeople are desperate for money and you remember who can print money? Having already lowered its interest rates to nearly 0 - it's forced to print money. 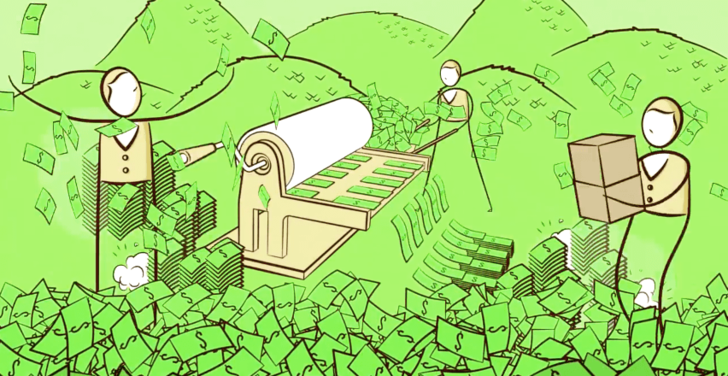 Unlike cutting spending, debt reduction, and wealth redistribution, printing money is inflationary and stimulative. Inevitably, the central bank prints new money — out of thin air — and uses it to buy financial assets and government bonds. It happened in the United States during the Great Depression and again in 2008, when the United States' central bank — the Federal Reserve — printed over two trillion dollars. Other central banks around the world that could, printed a lot of money, too. By buying financial assets with this money, it helps drive up asset prices which makes people more creditworthy. The Central Government, on the other hand, can buy goods and services and put money in the hands of the people but it can't print money. So, in order to stimulate the economy, the two must cooperate. By buying government bonds, the Central Bank essentially lends money to the government, allowing it to run a deficit and increase spending on goods and services through its stimulus programs and unemployment benefits. This increases people's income as well as the government's debt. However, it will lower the economy's total debt burden. This is a very risky time. 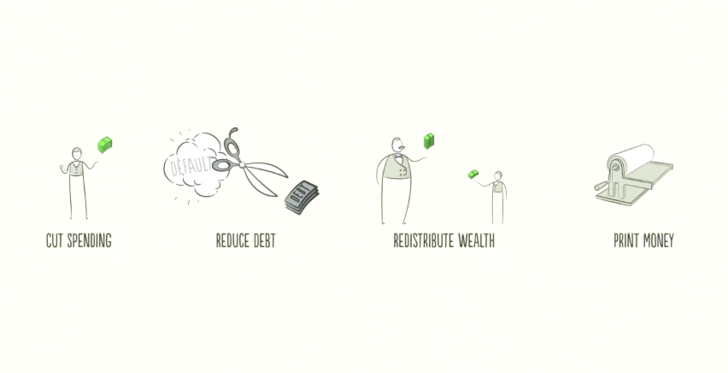 Policy makers need to balance the four ways that debt burdens come down. he central bank prints new money. 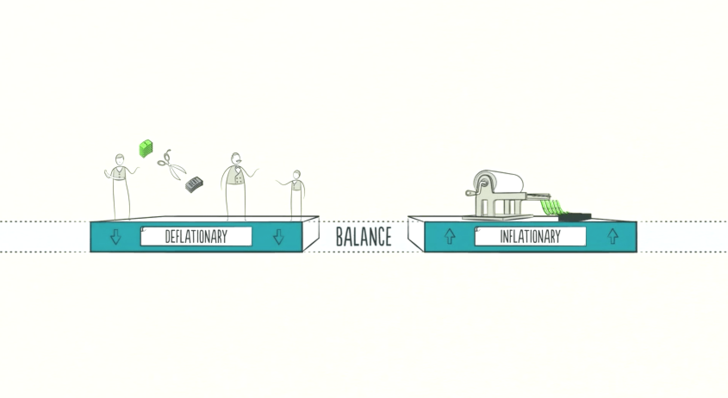 The deflationary ways need to balance with the inflationary ways in order to maintain stability. If balanced correctly, there can be a Beautiful Deleveraging. 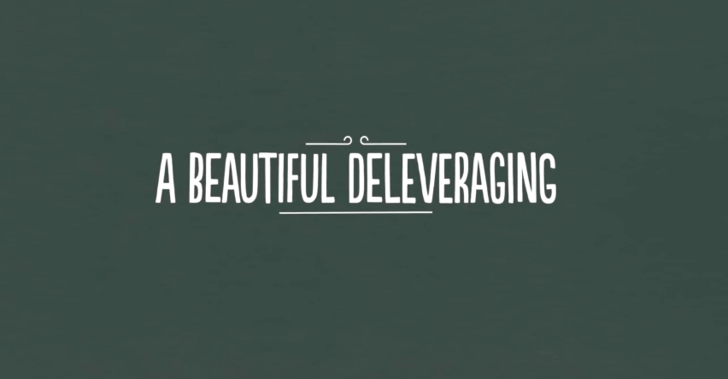 Even though a deleveraging is a difficult situation, handling a difficult situation in the best possible way is beautiful. A lot more beautiful than the debt-fueled, unbalanced excesses of the leveraging phase. In a beautiful deleveraging, debts decline relative to income, real economic growth is positive, and inflation isn't a problem. It is achieved by having the right balance. The right balance requires a certain mix of cutting spending, reducing debt, transferring wealth and printing money so that economic and social stability can be maintained. It won't if it offsets falling credit. Remember, spending is what matters. 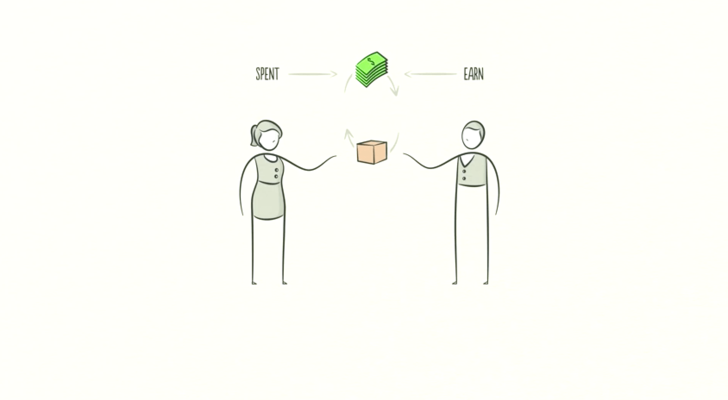 A dollar of spending paid for with money has the same effect on price as a dollar of spending paid for with credit. By printing money, the Central Bank can make up for the disappearance of credit with an increase in the amount of money. In order to turn things around, the Central Bank needs to not only pump up income growth but get the rate of income growth higher than the rate of interest on the accumulated debt. That means that the amount of debt it has is the same as the amount of income the entire country makes in a year. Now think about the interest rate on that debt, let's say it is 2%. If debt is growing at 2% because of that interest rate and income is only growing at around only 1%, you will never reduce the debt burden. You need to print enough money to get the rate of income growth above the rate of interest. However, printing money can easily be abused because it's so easy to do and people prefer it to the alternatives. The key is to avoid printing too much money and causing unacceptably high inflation, the way Germany did during its deleveraging in the 1920's. If policymakers achieve the right balance, a deleveraging isn't so dramatic. And when borrowers appear more creditworthy, lenders begin to lend money again. Debt burdens finally begin to fall. Able to borrow money, people can spend more. Eventually, the economy begins to grow again, leading to the reflation phase of the long term debt cycle. Though the deleveraging process can be horrible if handled badly, if handled well, it will eventually fix the problem. Of course, the economy is a little more complicated than this template suggests. However, laying the short term debt cycle on top of the long term debt cycle and then laying both of them on top of the productivity growth line gives a reasonably good template for seeing where we've been, where we are now and where we are probably headed. because, in the long run, that's what matters most. 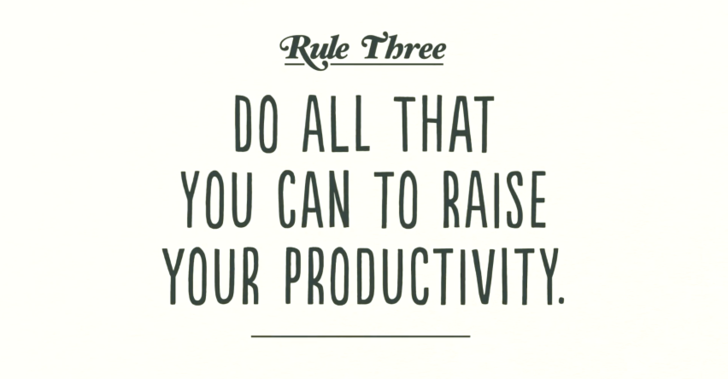 This is simple advice for you and it's simple advice for policy makers. You might be surprised but most people — including most policy makers — don't pay enough attention to this. This template has worked for me and I hope that it'll work for you.